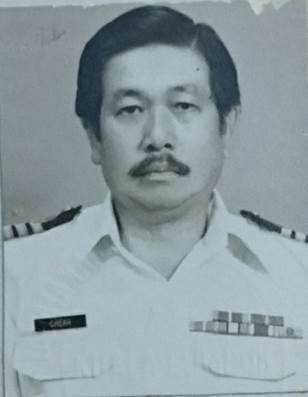 The Malaysian Armed Forces Chinese Veterans Association (MACVA) archives on the contributions to King and Country from its members shall not be complete without a reveal of Captain Cheah Leong Voon’s RMN (Rtd) N/400077 naval resume; he was truly a pioneer in the formative years of the RMN. Incidentally, the first serial number for any RMN commissioned officer begins seven digits away at N/400070. Cheah, born on 2nd March 1936 in Ipoh, obtained his early education in St. Michael’s Institution, completed his Senior Cambridge Certificate in 1954. Guided by the inability to continue long term tertiary education due to poverty, he opted to seek employment to support the rest of his family. So admittedly, he filled up and submitted just almost any application forms that were made available to him, however, the one for the navy was coincidental; it was casually handed over to him by a friend, the friend already wore thick reading glasses then. Cheah was called up for an interview and the initial selection process in Singapore; but not before he had to pacify the parent’s “common and typical enlistment concerns”. Resolute in seeking a job, he attended the selection process in Singapore through convincing his parents that it was a 2nd class railway travel, a screening process, nothing is casted in stone, it would be a good exposure in life for a first time traveller like Cheah, and most importantly they were all for free. How miscalculated Cheah was, he was notified some time later after his return that he was successfully shortlisted. This time around, the new lines of arguments that Cheah used to cajole his parents were – travel 1st class, immediate regular income, free board and lodging, free uniform, training overseas, overseas allowance, etc. Poverty versus signing up, Cheah’s odd were definitely better, the parents relented. He joined in Singapore on May 1955. 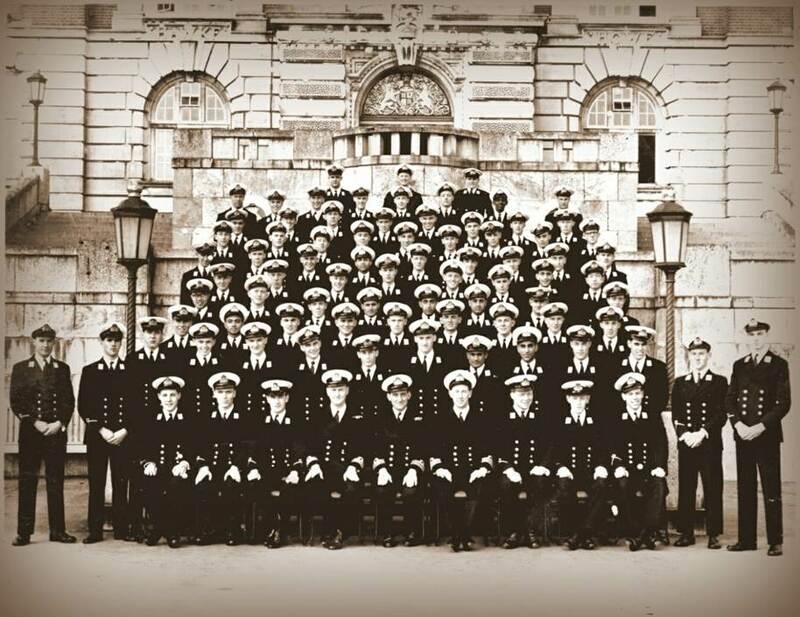 After the initial basic cadet training, he was sent to Britannia Royal Naval College (BRNC), Dartmouth, United Kingdom (UK) together with eight other fellow cadets on December 1955 in time for the January 1956 intake. (Only two other local cadets were ever admitted individually and separately to BRNC before this first admission of a batch. Chia Cheng Lock N/400072 and Charles Thong Yin Sin N/400073 joined earlier but they were trained under the Royal Navy “Benbow” scheme respectively). This first batch of nine cadets’ selection was actually more aligned to the navy’s original forecast for six trainees; the earlier intakes were only successful in admitting individuals, and on two different occasions. In fact, they were all told by Capt H. E. H. Nicholls RN, the first Senior Officer of the RMN (SORMN) of the Malayan Naval Force, that in a matter of 15 years, one of the 11 Malayan Naval Cadets would command the Navy. We know today that Tan Sri K Thanabalasingam and Dato’ Mohd Zain Mohd Salleh, both from this first batch of nine, rose up in rank to become the first and second Chief Naval Staff (CNS) respectively, with Thanabalasingam taking over in December 1967, much earlier than had been predicted. 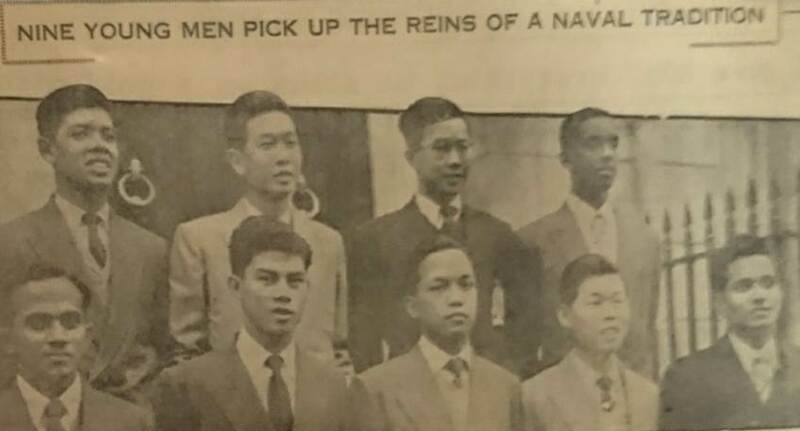 The first batch of nine Malaysian Naval Cadets selected to undergo BRNC Officer Training on December 1955. Cheah is second top Row from left. Arguably, one of the pace setters in his cadet days, Cheah passed all his regulated, practical and professional exams timely; meritoriously and progressively he advanced in rank and seniority. He successfully passed out of BRNC and was despatched to the next phase - sea training. Cheah Leong Voon, Khoo Tee Chuan and K Thanabalasingam in the Spring 1958 Britannia Royal Naval College (BRNC), Dartmouth, UK Passing Out Group Photo. Attached initially to the Royal Navy’s Mediterranean Fleet, onboard HMS REDOUBT, he was exposed to ships undertaking amphibious landings, his very first basic exposure to the commando type of operations. Cheah was however, quickly recalled from the Mediterranean Fleet due to the onset of the Lebanon Crisis; and was reassigned to serve onboard HMS DILIGENCE and then HMS REDPOLE, in the UK Home Fleet, where he picked up his skills and knowledge on minesweeping and successfully obtained his Watchkeeping and Ocean Navigation Certificates. It was then time to return and serve the RMN full time. Cheah was Cadet Officer from December 1955 until he was commissioned as a Sub-Lieutenant RMN (Sub-Lt) on 1st November 1959. His skills and professionalism recognised Lt Cheah RMN was selected along with Lt Charles Thong Yin Sin RMN to be the first two CO’s of KD KINABALU and KD JERAI respectively. Malaysia commissioned the two British “Ton” Class Coastal Minesweepers from the Royal Navy into the RMN fleet on April 1964. 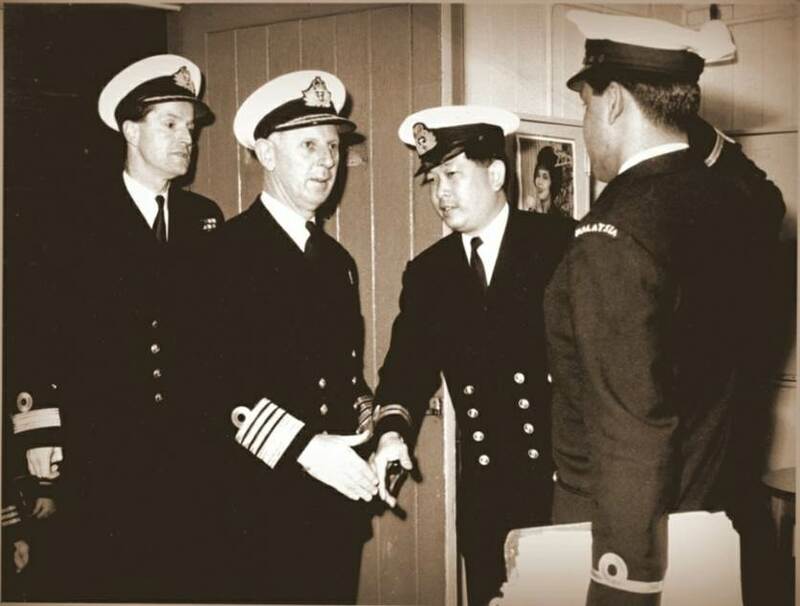 Charles and Cheah, both promoted to Acting Lieutenant Commanders RMN (Lt Cdr) simultaneously, sailed for 3 weeks these newly acquired vessels from UK to Malaysia, arriving incidentally just a few days before the incident of KD SRI SELANGOR clashing with the KKO Indonesia, the aggressions of an undeclared war – The Indonesia Confrontation, a violent conflict from 1963–1966. These two new vessels served in the forefront patrolling our sea borders during that period. CO Cheah Leong Voon & Executive Officer (XO) Gerry Isaac in the UK participating in the Commissioning and Handing Over of KD JERAI & KD KINABALU. Cheah became the first CO of KD KINABALU. KD JERAI & KD KINABALU in the UK 1964, just before they were sailed home to Malaysia to join the RMN Fleet. At the height of the Indonesian Confrontation in 1965-1966, the Ministry of Defence had called for volunteers from the Army and Navy for introductory Commando training conducted at Majidee Camp by British Commandos. Lt Cdr Cheah RMN was consciously and proactively volunteered by his British superiors - “there is a war on, and you are the best man for the job”, was the response given when he protested politely on why he was taken away from his comfortable command in KD KINABALU (on the other end of the scale, to be removed from command is a punishment). Cheah had no counter arguments, he complied and completed his basic Commando course; and was awarded a “Green Beret”. He took over command of the Naval Element of the Malaysian Special Service Unit (MSSU) – a joint Commando Unit with another illustrious Malaysian son, Major (Maj) Abu Hassan commanding the Army element. The MSSU was tasked to conduct clandestine operations, unconventional warfare, sabotage and intelligence gathering modelled after the British Royal Marine Commandos. When seen historically today, MSSU is actually the precursor to the establishment of separate commando elements for Malaysia’s Army, Navy and Air Force. We know now that the Malaysian Army Special Forces Unit (Commandos) commemorates their anniversary yearly, beginning 1st August 1965, and a birth that was given by the now defunct MSSU. Cheah already had experience, exposure and advanced seniority by the mid 60’s, so much so that the only career route left open was upwards and forward. After MSSU, he was sent, as the first ever Malaysian naval officer, to undergo staff college training – in the Defence Services Staff College, Wellington, India, where he obtained his ‘psc’. And then, quite unexpectedly, the government decided to Malaysianise the CNS position for the RMN. Two candidates were shortlisted, and Cheah was the senior of the two. 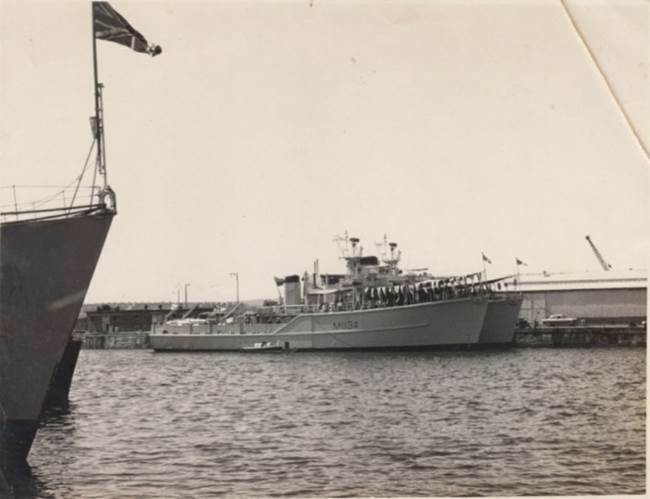 He had already attended short courses in UK - HMS DRYAD, HMS VERNON and HMS OSPREY and on his return from Staff College in India, he was sent to Australia – HMAS CERBERUS and HMAS WATSON for more short courses. He was given command of the then largest warship of the RMN – KD HANG TUAH and later the CO designate of KD HANG JEBAT being built in Glasgow. He was appointed the Deputy Commander Naval Forces (West Malaysia); and then took over the Commander’s appointment eventually. Cdr Cheah RMN as CO KD HANG TUAH onboard in front of the 4” A Guns. November 1967 - Cheah greeting a welcome onboard KD HANG TUAH to Prime Minister Malaysia, Tunku Abdul Rahman Putra Al-Haj, wife Sharifah Rodziah Syed Alwi Barakbah and Chief of Navy, Commodore Allen Nelson Dollard. Jackstay transfer Cheah off KD HANG TUAH. Jackstay is used for transferring personnel, provisions, and light stores with a maximum load of about 250kg. A traveller block is hauled back and forth along the jackstay wire by an in–haul rope in the receiving ship and an out–haul rope in the delivering ship manned by up to six crew in each ship. Working distance limits are up to 24–61 meters with a normal working distance of about 34 meters. History records that the RMN was totally Malaysianised by 1st February 1971. All four top command posts were already held by Malaysians – CNS Commodore Thanabalasingam RMN, Principle Staff Officer Mindef Capt Mohd Zain Bin Mohd Salleh RMN, Commander Naval Forces West Malaysia Capt Cheah Leong Voon RMN and Commander Naval Forces East Malaysia Cdr Ismail bin Hassan RMN. In fact, it was reported in the The Straits Times of 2nd January 1971 as follows: “A key appointment which became effective today is that of Comdr Cheah Leong Voon (below) promoted from Deputy Commander Naval Forces (West Malaysia) to Commander. Cheah had already served in almost all commands and pioneering positions of the RMN by the late 70’s. Apart from patrol vessels, inshore and coastal minesweepers, frigates (old & being built), he also rose in rank and stature to helm both the COMNAV (West) and COMNAV (East), which were re-designated “Panglima Wilayah Laut Satu & Panglima Wilayah Laut Dua” command positions respectively. Alvi (LV), amongst close friends, nonetheless was still one of the Navy’s top gun even in the 80’s. Apart from being appointed the Director Naval Plans & Operations in Mindef, he even had an international spell added to his roles and responsibilities in that he served as the Defence & Armed Forces Attaché Washington DC, USA for four years; and was concurrently accredited to Canada in the same period. Cheah was accorded the traditional navy farewell send off as COMNAV West (Re-designated Panglima Wilayah Laut Satu) by fellow officers from the Base & Fleet. Cheah (wife Mabel) as Defence & Armed Forces Attaché from 1977 till 1980. The couple hosted the Malaysian Armed Forces Day celebrations in Washington, DC, USA. For exceptionally meritorious conduct in the performance of outstanding service while serving in Washington DC, USA as the Defence & Armed Forces Attaché to the Embassy of Malaysia from March 1977 to November 1980, the United States of America (USA) had awarded Colonel (Col) Cheah, (the RMN had then used the equivalent Army ranks for a period of time before reverting to the traditional Navy ranks again later), The Legion of Merit (Degree of Officer) Medal. In the citation for the award, Cheah’s dynamic leadership, exemplary professional competence, and exceptional devotion to duty keeping with the highest traditions of the Naval Service were mentioned. Practical as he always was throughout his career, Cheah was already conscious, long before his appointment to the USA, that he would probably be reassigned appointments that he had already served in, if he was to continue on with his career in the navy. On his return, the time was ripe to call it a day; he already qualified to draw a small naval pension by then. He requested for and was granted early optional retirement on 14 May 1982, after completing a total of 27 years service. In testimonies, the CNS Rear Admiral Dato’ Mohd Zain Bin Mohd Salleh RMN, who hosted a formal farewell dining out for Cheah had intimated – “Saya sungguh merasa terharu akan kehilangan seorang rakan perjuangan yang rapat.....” and Vice Admiral Tan Sri Abdul Wahab Hj Nawi RMN, the third CNS wrote - “Beliau telah berkhimat dengan taat setia dan cemerlang di kesemua perjawatan yang dipegangnya termasuk sebagai Panglima Wilayah Laut Satu dan Dua dan juga sebagai Atase Pertahanan di Washington DC, USA. Beliau dianggap sebagai salah seorang pegawai perantis jalan kepada TLDM” – the last five Malay words pointedly acknowledged his pioneering activities for the RMN. Both Dato’ Zain and Tan Sri Wahab had served together with Cheah. Immediately on retirement, he accepted a role as the Manager of Thyssen (Thyssen Krupp) Kuala Lumpur, his “greener pastures” after the naval career. Thyssen was of course in the thick of things involved with the plans to build the RMN Naval Dockyard, Lumut and the Corvettes. Cheah worked with Thyssen until his retirement, this second retirement was at 73 years of age. While serving Thyssen Malaysia Cheah received visits from the Chief of Navy and The Yang Di Pertuan Agong during exhibitions. Capt Cheah RMN & the late Capt Khoo Tee Chuan RMN (batch mates) in Dartmouth 10 May 2008, to join the BRNC 50th Years Anniversary Celebrations. Cheah was a member of the British Institute of Management, the Naval Institute and the Royal Institute of Navigation. He was awarded the PBS from Sarawak, KMN and AMN Medals from the Federal Government in recognition of his outstanding contributions and services. Cheah receiving his Federal and State Awards. Cheah is married to Mabel Leong Yoke Cheng, has three sons and five grandchildren. He is a regular at the Armed Forces Veterans Rendezvous (RV), a comrade and brother at arms throughout till this day. Apart from the Navy, Cheah feels that someone up there is looking out for him all the way, he is blessed. MACVA is very proud of Captain Cheah Leong Voon's RMN (Rtd) achievements. We value his sacrifices for the King and country and would like to wish him good spirit and health in retirement. We hope he continues to meet up with us in the monthly Armed Forces Veterans rendevous. Cheah, wife Mabel and Soon in discussions for this article on December 2017.